In the final phase of this grooming horses tutorial, you'll learn how to clean or "pick out" the hooves. 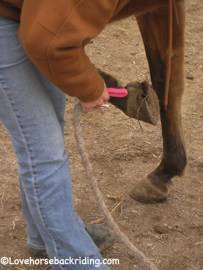 Picking out the hooves is an important step your grooming routine to keep your horse's feet both healthy and sound. If you just landed here, go to this page to start back in order at the beginning. 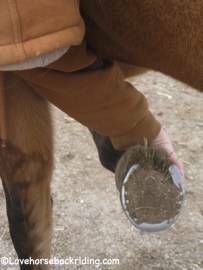 Hooves should be cleaned daily if possible, to keep impacted material from rotting the hoof. Also, it keeps hard objects such as rocks from causing lameness. Drape the lead rope over the crook of your arm. 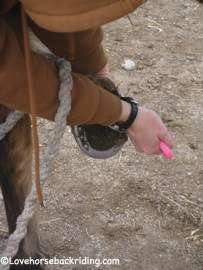 Gently squeeze the chestnut with your fingers adding pressure until the horse lifts his foot, at which point you immediately stop squeezing and are ready to support him. Alternately, you can run your hand further down the leg and squeeze the tendons at the back of the cannon bone. This is a less effective method, but it is more widespread way of teaching this step of grooming. Once he picks up his foot, you'll quickly need to be there to hold it up or he'll try and put it back down again. In this picture you can see I'm just beginning to get a hold of his leg at the ankle. Make sure your feet are off to the side so if he puts his hoof down your toes are out of the path of getting smashed! 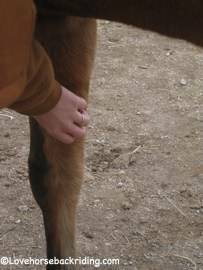 Quickly you'll transfer your hold of the hoof by supporting it underneath. This will support his foot. You can see how much dirt is packed in there. 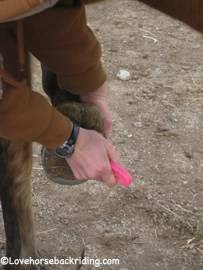 Now you'll take the hoof pick and point the "pick" part away from you. You'll start digging and scraping the "V" of the frog first starting near the bulbs of the heel and working towards the toe. 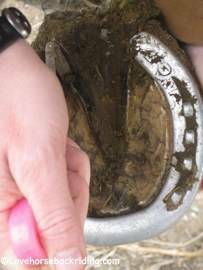 When grooming horses, this is the easiest and most effective method for getting the feet clean. There is no need to worry about doing this too hard. This outer layer of the foot is like our fingernail and lacks nerves and feeling. It does not hurt horses to clean their feet. Continue along the inside of hoof wall and shoe line if any until all remaining dirt, rocks, and debris are gone. When you are done, gently place his foot all the way back on the ground. It's polite to do so. Avoid dropping the foot abruptly. If you've followed all the steps, you should be all done grooming, and can move on to saddling and getting ready to ride. Or if you'd like, you can go back and review the last page, or start over from the first step of grooming horses by using the buttons below. Trot on on back to the home page from grooming horses to learn more about natural horsemanship and "how to" tutorials for handling horses.